Actually had to google it...I'm behind on firearms, apparently LOL. Looks nice! Never heard of it.. post pics! Guy's- Here are some pictures.... It's in their Flat Dark Earth color; aka FDE. More pictures... Here's a couple of pictures with my Colt CAR-15 for comparison size-wise. It has the stock fully collapsed. 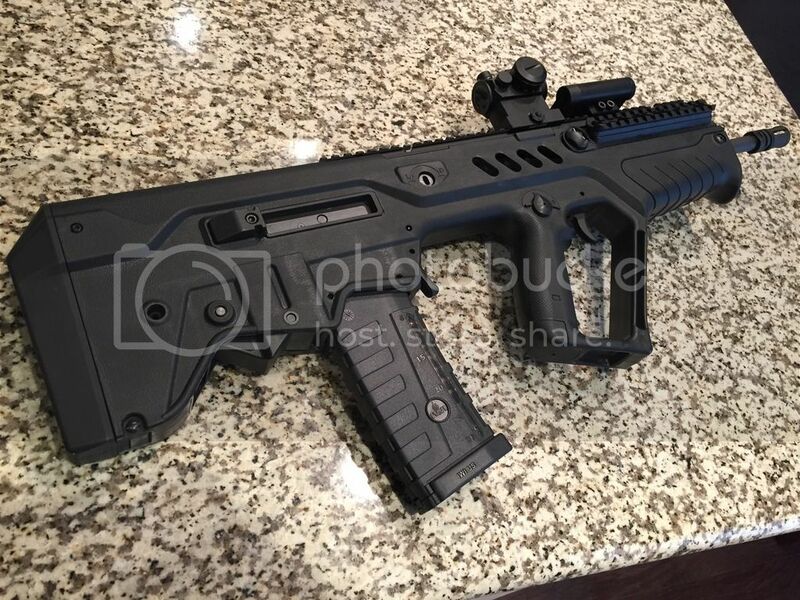 You can get the Tavor with a 5.56 or 9MM conversion kit, depending on the model you initially purchase. Btw, if anyone is interested, the Colt CAR is BNIB and depending on price, could be sold with some good options. If interested in a package deal, just let me know. I've has 2 of them in the past, so no need for me to go shoot this one. Nice! I like me a good bullpup setup. My buddy has one in 5.56/223. Fun to shoot. I have one and love it!! It's slightly heavy but the ergonomics make up for it. We need to go shoot some time. I've hit steel at 400yrds with a magnifier on the red dot. Would love to see how the Geissele drop in trigger feels. .50 Cal is too much for me... Need a mile of clean land to have fun with that! How much are you looking for on the Colt? It's a LE6920-brand new have the box and all paperwork. 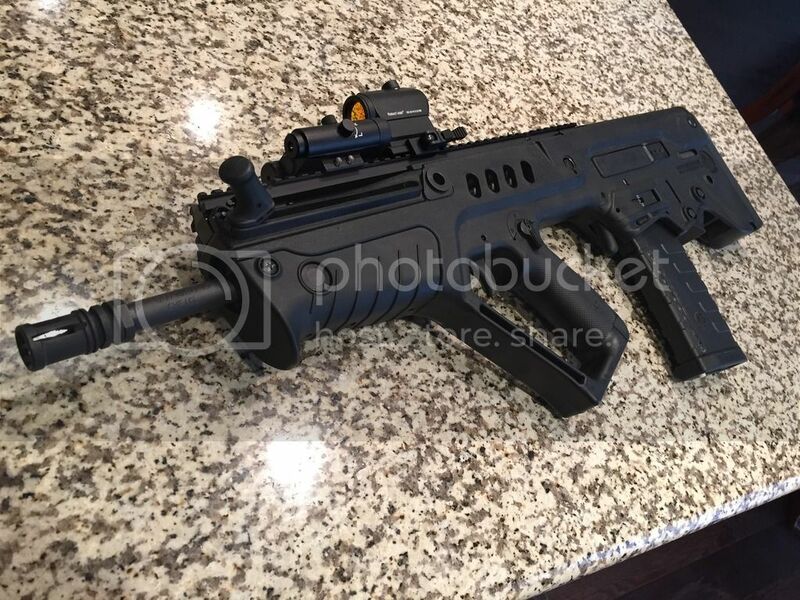 I really wanted a Tavor. I am fortunate to have friends who have access to most things that go bang. I loved it and found it very easy to shoot after years of AR platform use. 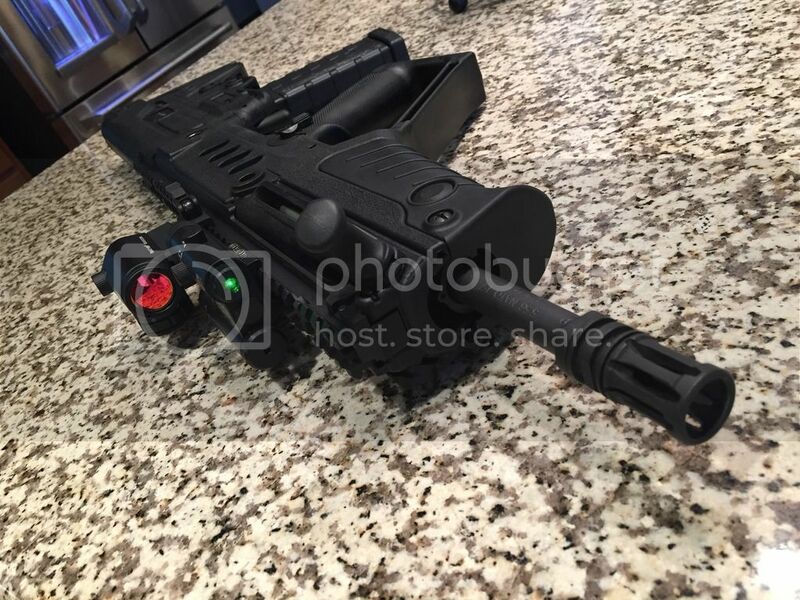 The thing that stopped me was when shooting it suppressed the gas port is right under my nose and it is not my jam to get the gas face when shooting. Non-suppressed this is a great platform. Just my experience. So, the suppressor arrived, about 6 months to the day right after the paperwork was submitted. It's a super quick affair to put it on. Very quiet; sounds like a .22, and you can hear the bullet hit down range. So far, very impressed. However, gas blow-back from the port cover is more than I expected. It's a known issue on all suppressed Tavor's, but there is a fix. I've ordered it. I'll see if I can post the video and a link to it.